Saturday saw an all star cast of marshals and race directors pull together to create a great inaugural 10k valley trail race. 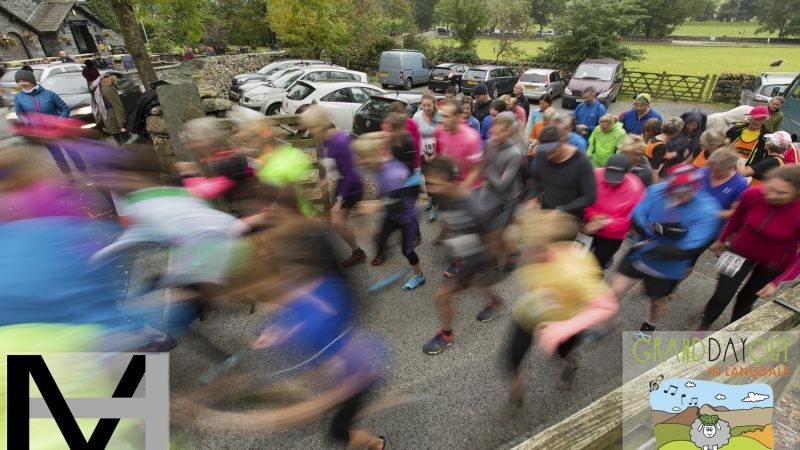 The start was at Stickle Barn and with 39 runners entered already we knew we had a small race at least, but with another 24 runners signing on, on the day and only 3 no shows we had a start crowd of 59 runners. 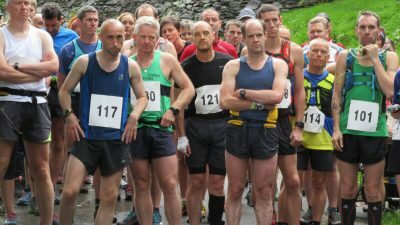 The start was 11:00 prom and the 59 runners headed directly out of the Stickle Barn carpark to follow the Cumbria Way to the first split time checkpoint at the last intake wall up the head of the valley at Mickleden. Now turning back down the valley the route came thorough Stool End Farm and to the road junction to take a right turn and head them into the Great Langdale Campsite. Now they headed up out of the back of the campsite to follow the L100/50 route in reverse to Oak Howe and then take the bridge over the river to bring them back up the north side of the valley and up the 'new' cycle path. Tom Jones and James Chapman controlled the mens race leading from the off and staying within 7 seconds of each other most of the way round, finishing 1st and 2nd respectively, with Paul McKnespiey taking the 3rd place. Abigail Johnston took the Ladies 1st place, leading all the way round and finishing 10th overall, with a McKnespiey take over for 2nd & 3rd as mother and daughter Camilla and Emma fought it out finishing 23 seconds apart. Joe Faulker of Nav4 Adventure swept the 1st part of the course, with Colin Harding and Helen Pye sweeping the rest, during the race Gaynor Prior of Pure Outdoor Events whipped Wayne Singleton into shape with a bespoke personal training session for a marathon that Wayne has entered, whilst she took the 'Oak Howe' split times, meaning we missed the seconds here I'm afraid folks. We had plenty of other great marshals out on the course and of course all these folk volunteered their time to make the race happen. As always, we thank them all greatly. Ot was noted that a Dog and a Sheep took part, but all was revealed to be fine as the sheep turned out to give the prizes away and was in fact Tom Rumsey, one of the main organisers and the dog was actually his good lady, Emliy Bayne, who never caught him so no sheep worrying happened that day! Thanks go to the land owners, the National Trust, for the use of the valley floor and all the farmers who let us run through yards and fields without question, plus of course the Stickle Barn crew and the Great Langdale campsite for the excellent overall 1st winners prize of a 1 night stay in a camping pod, plus a meal for 2 in the Stickle Barn. 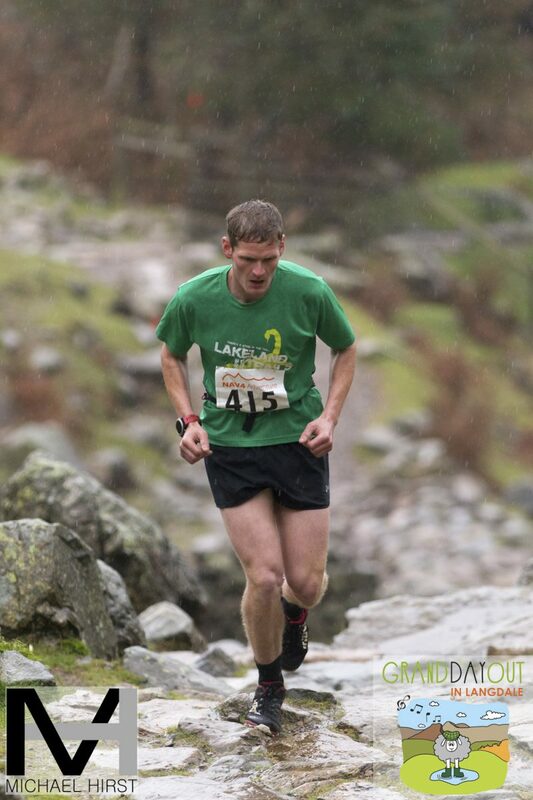 The Uphill 'Stickle Grind' Race is a fairly new phenomena for the Lake District, there have been a few uphill only races, but not many. 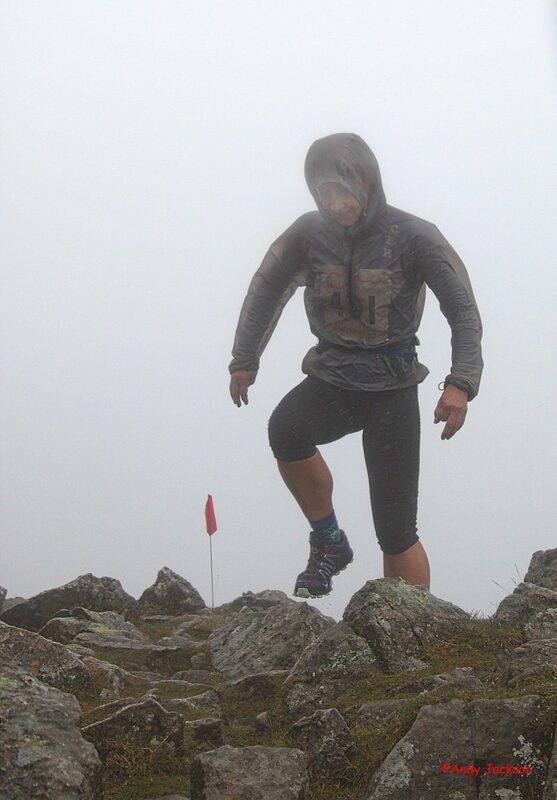 The most obvious line seemed to be the ultra steep and ultra fast ascent onto the top of Harrison Stickle. It takes the footpath right out of the back of the pub, the Stickle Barn (events centre for the weekend) and taken in Stickle Tarn and then keeps ascending to finish on Harrison Stickle, so of course the Stickle Grind is a fitting name for this 2.6km and 605m of leg burning and lung bursting fun. 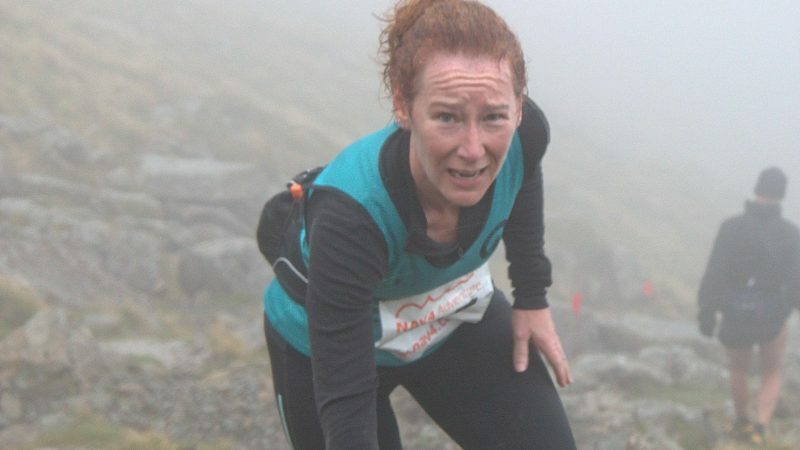 We had 19 entries online and a 4 more on the day, and with pretty dank valley conditions we only had 3 no shows, so a total of 20 hardy fell runners toed the line, in minute increments, to set off and chase each other to the summit of Harrison Stickle. This adds for an exciting element of the 'Uphill Only' race as competitors have a target of other runners to chase down. We kept most of the fast boys and girls till the end to heat up the race. 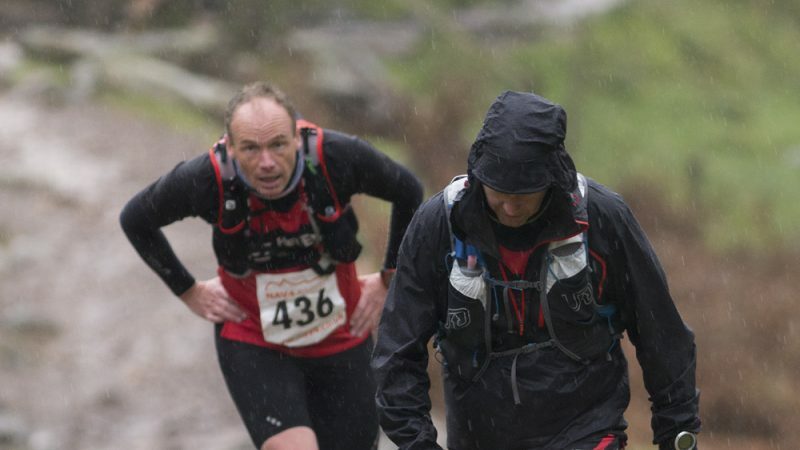 Joe Faulkner and Barney Whiteside drew the short straw to sit on the summit and time the runners in and with horizontal rain and wind to keep it that way, these guys struggled away as the runners steamed to the top. To keep the 'Euro' feel to the event we armed the rest of the marshals team, who consisted of Steve Clee, Little Dave, Rachel Plat and Colin Harding with Lakes Sky Ultra cow bells. 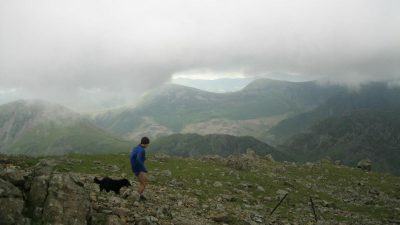 The cloud was low and the runners disappeared into the mist just after our National Trust safety guy, Gareth Fields, saw the runners through the small scrambley section on the first part of the course. James Warberton set off like to steam train to chase Phil Wilkinson to take the 1st place, with Michael Jones taking the second place with a great run and only 8 seconds behind James. Phil Wilkinson took the 3rd place, still fuelled by half a bottle of port from the night before we later learnt. James set a great record of 26.54 in the conditions at hand and we look forward to aspirant 'uphill' runners to come and have a go at re-setting when we next run the course. James also took the overall 1st place prize, very kindly donated by the Brimstone Hotel, of a 2 night stay for 2 in the Langdale valley 5 Star hotel! We hope you enjoy the stay James. The Ladies race was won in a fantastic time of 38.07, by Lindsay Buck, who finished in 10th overall as well, with Alice Melton and Elizabeth Adams taking 2nd and 3rd respectively. Thanks again to all the amazing marshals, Nav4 Adventure for sponsoring the race numbers, to Gaynor Prior for the flapjack at the midway station, Andy Jackson for turning up and enduring the weather and risking ruining a camera to take some great shots, considering the conditions, the Langdale Spa complex for the amazing first prize and Cowmire Hall Cider for supplying the other prizes. Thanks as well go to all the runners who entered and turned up to give us a 1st race! I must also apologies for the delay in the prize giving and its disorganised state, with the weather as it was our comms didn't work well at all and we had to wait for Joe to arrive at the events centre before we could sort out the race timings and winners.